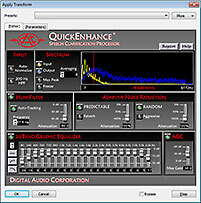 QuickEnhance is now supported by a larger set of programs including Adobe Audition, Audacity, Avid Media Composer 8 and more via v2.3.0 AS and 2.3.2 AAX/VST 64bit versions. 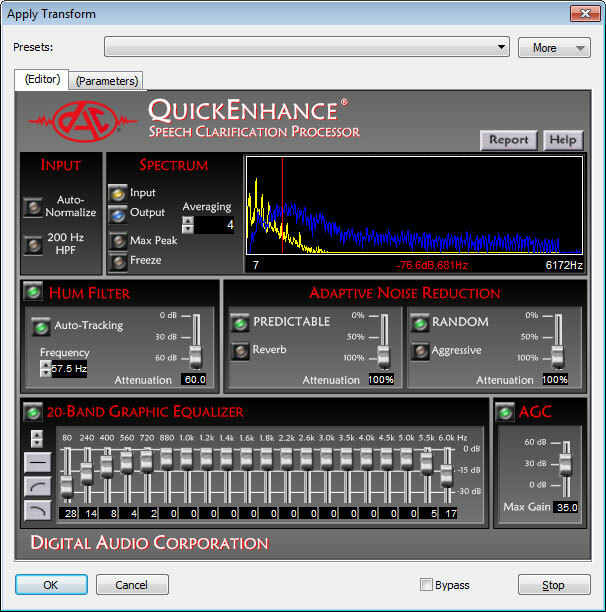 The QuickEnhance plug-in suite is designed specifically for forensic audio clarification, so there is no need to hunt through a long list of audio effects filters designed for creative audio professionals. In a single streamlined interface you have the filters you need to address all the most common audio problems that are preventing you from hearing import elements in your audio evidence. Reduce background noise such as hums, electrical interference, air conditioners and tape noise to improve the clarity of voices and other audio evidence that are important to your case. AAX and VST Plug-in FREE to Existing QE/AS customers. If you already own the DAC QE Audio Suite plug-in box version with dongle, these are a free upgrades from the Ocean System download page. Audio Suite (AS 32bit and AAX 64bit) Avid Media Composer and Pro Tools. Virtual Studio Technology (VST 32/64bit) Sony Sound Forge, Adobe Audition, etc. For those they that want even more power and control, we offer DAC Cardinal which is also available for demo as a VST plug-in.